Add Recombinant human Tif1 gamma (Trim33) to my shopping cart. Full length recombinant human N-terminal Flag tagged TRIM33 (Tripartite Motif Containing 33) protein, produced in SF9 insect cells. TRIM33 (UniProt/Swiss-Prot entry Q9UPN9) is a member of the tripartite motif (TRIM) family. The TRIM motif includes three zinc-binding domains - a RING, a B-box type 1 and a B-box type 2 - and a coiled-coil region. TRIM33 is an E3 ubiquitin-protein ligase, which promotes SMAD4 ubiquitination, nuclear exclusion and degradation via the ubiquitin proteasome pathway. It may act as a transcriptional corepressor and inhibits the transcriptional response to the TGF-beta/BMP signaling cascade. However, molecules that interact with this protein have not yet been identified..TRIM33 also plays a role in the control of cell proliferation. Its association with SMAD2 and SMAD3 stimulates erythroid differentiation of hematopoietic stem/progenitor. Defects in TRIM24 cause thyroid papillary carcinoma. Purified using FPLC, >95% purity as determined by SDS-PAGE. 20mM Tris-Cl pH 7.6, 1 mM EDTA, 0.15 M NaCl, 10% glycerol, 0.5 mM PMSF and 1 mM DTT. Store at-80°C; guaranteed stable for 2 years from date of receipt when stored properly. Precautions: This product is for research use only. Not for use in diagnostic or therapeutic procedures. 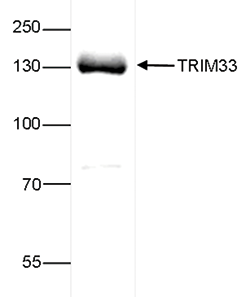 SDS page of the TRIM33 recombinant protein. The position of the protein of interest is indicated on the right; the marker (in kDa) is shown on the left. Diagenode strongly recommends using this:	Recombinant human Tif1 gamma (Trim33) (Diagenode Cat# C23010110). Click here to copy to clipboard. Add Recombinant human MBD4 to my shopping cart. Add Recombinant human Asf1a to my shopping cart. Add Recombinant human Asf1b to my shopping cart. Add Recombinant human MeCp2 to my shopping cart. Add Recombinant human PRMT5 to my shopping cart. Add Recombinant human Tif1 alpha (Trim24) to my shopping cart. Add Recombinant human Hp1 alpha (CBX5) to my shopping cart. Add Recombinant human Hp1 beta (CBX1) to my shopping cart. Add Recombinant human Hp1 gamma (CBX3) to my shopping cart. Add Recombinant human UBA1 to my shopping cart. Add Recombinant human UBE2D3 to my shopping cart. Add Recombinant Biotinylated-ubiquitin to my shopping cart. Add Recombinant mouse TDG to my shopping cart.